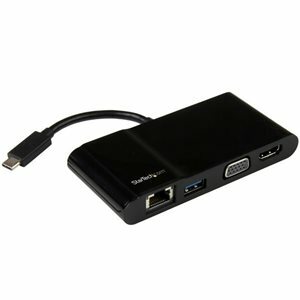 Turn your laptop into a compact workstation wherever you work or go, adding video, Gigabit Ethernet, and a USB 3.0 port through USB Type-C (5Gbps).This USB-C multiport adapter for laptops changes the way you work when you're on the move. It lets you create a workstation when you travel, and it's one of the first multiport adapters to integrate a USB Type-C host connection. Now, you can create a permanent or temporary workstation virtually anywhere you go.It's a versatile and portable way to help you connect additional devices to your port-limited laptop (for example, your Dell Precision, Dell XPS, Samsung Galaxy TabPro S, or Google Chromebook) using its next-generation USB-C port, so it's perfect for mobile work.This multiport adapter features an integrated and easy-to-use USB Type-C connector. To take full advantage of USB-C and DP alt mode, the adapter converts the video and data capabilities of your laptop's USB-C port into four individual ports. You can save money and use the adapter with your existing peripherals, and with its built-in cable, there's no need to carry around a separate host cable.The adapter's USB-C connector is small and reversible, which makes connecting it to your laptop faster and easier. Now, you can spend more time working, and less time setting up your workstation. Plus, you can connect the plug with either side facing up, so there's less risk of damaging your laptop port. And because it uses USB-C, the adapter is Thunderbolt 3 data port compatible, so you can connect it to your Thunderbolt 3 equipped laptop.With a range of convenient features, the travel adapter is ideal for quick setups in conference rooms or boardrooms.For maximum portability, the combo adapter consolidates multiple ports into a single, lightweight casing. Because the ports are combined into one convenient travel adapter, you can leave your individual single-function adapters at home or at the office.Plus, the adapter is bus powered, so there's no need to carry around a separate bulky power adapter. With USB-powered performance, you can travel lighter, more efficiently, and with less hassle.This versatile USB-C multiport adapter for laptops makes it easy to create a mobile workstation when you need it most. It features HDMI (with audio) and VGA ports, so you can easily connect a 4K HDMI or a standard-definition VGA monitor. The adapter gives you an easy way to connect an external display or a projector to your laptop.Installation is fast and simple, with native support in most operating systems. Plus, the adapter integrates a Gigabit Ethernet port and an additional USB 3.0 port (USB 3.0 is also known as USB 3.1 Gen 1), so you can access a wired network, or connect an additional USB peripheral to your laptop.For MacBook host systems using macOS 10.12, version 10.12.6 or later is required to support this product.Your USB-C equipped host laptop must support video (DP alt mode) to work with this adapter. The adapter does not support USB Power Delivery.